Welcome to the March 2016 issue of the AXIe Newsletter. Our AXIe Consortium LinkedIn membership numbers continue to increase and we are now a community of over 342 members. Cobham officially unveiled their AXIe offering last week at WinnComm, the premier SDR (software defined radio) conference. As a reminder, Cobham is the new name of the company previously known as Aeroflex, having purchased Aeroflex in 2014. Frequent readers of EDN’s Test Cafe column will recall our exclusive sneak preview of Cobham’s AXIe products in an October column entitled Cobham leaps into AXIe. There, we highlighted that Cobham’s upcoming transceiver density was double that of those available in PXI, entirely due to the density advantage offered by AXIe. We also highlighted Cobham’s deployment of Wide PCI Express (16 lanes in each direction), allowing nearly 16GByte/sec of streaming bandwidth per slot each direction, 32 GByte/sec total. Cobham made their AXIe introduction official last week at WinnComm, but it was the software that was the real surprise. In a press release entitled Cobham and NordiaSoft announce world’s first integrated SCA development and test system, the two companies announced that they were joining forces to offer SCA (Software Communications Architecture) developers an integrated development platform for software defined radio development, emulation, and test. 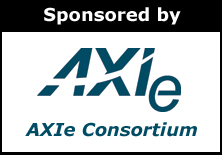 The AXIe Board of Directors approved a new revision of AXIe-2 Base Software Specification. It, along with all other AXIe specifications, can be found on the specification page here. The core AXIe specification is AXIe-1, and describes the hardware aspects of the AXIe standard, such as module size, backplane definition, and power and cooling. AXIe-2 adds software requirements for an AXIe chassis or module. AXIe-1 was upgraded last year with revision 3.0. The highlight of that change was to quadruple the PCIe (PCI Express) bus width from four lanes to 16 lanes. This is the widest PCIe fabric of any modular instrument standard, and contributes directly to bus speed. You can read about the upgraded speed here. While AXIe-2 specifies the software necessary to support AXIe chassis, system modules, and instrument modules, another key goal has been interoperability with PXI systems. Complying with AXIe-2 causes the AXIe products to appear as PXI products, facilitation integration of the two architectures together. If you’re a frequent reader of this column, Test Cafe, you are probably familiar with AXIe. Positioned as the “big brother to PXI”, AXIe is a modular instrument standard similar to PXI in many respects, but utilizing a larger board format that allows higher power instruments and greater rack density. Since it relies chiefly on the same PCI Express fabric for data communication as PXI, it is nearly indistinguishable from PXI when viewed from the test system controller and is programmed similarly. For more information, you can read my recent tutorial about AXIe here.